You are currently browsing the CycleStreets blog archives for December, 2015. 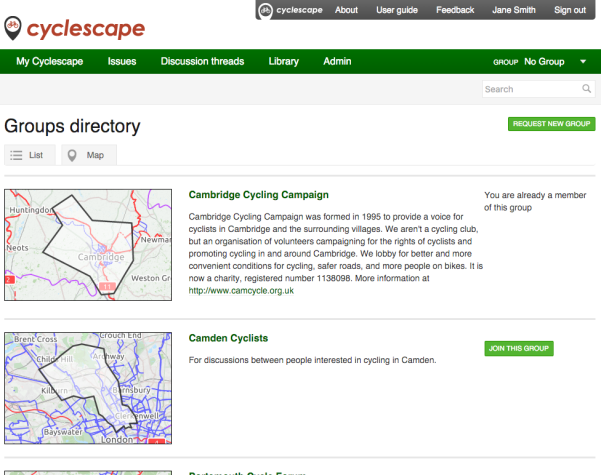 Lots of new features have been added to Cyclescape, our toolkit for cycling advocacy groups. Our developer, Nikolai, has been busy, working on piles of improvements and bugfixes. Street View message replies: While it’s of course possible to navigate off-site, get a Street View link, and return, we’ve taken out that extra stage. The Street View button also tries to find a sensible default location. 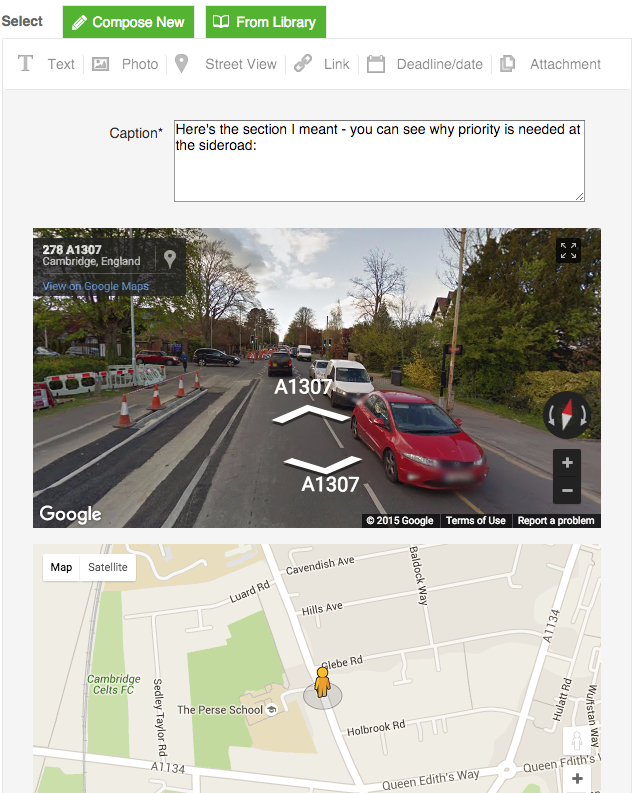 In a thread, just click on Street View in the reply box, position the map where you want, add a comment and press submit. Privacy improvements: Some groups have told us that it is important to them that they are able to operate on the basis of member discussions using real names, so that members know who they are talking to. However, we recognise that this could be in conflict with the entirely reasonable desire not to have one’s name on the public internet if wished. Accordingly, we have worked to implement a solution to this, whereby you can set your real name which people in your groups will see, but set a display name for everyone else. Previously the display name was always used. Improvements for groups: If you didn’t already know, cycling groups are able to create their own Cyclescape space, giving a custom web address and various personalisations. You can now create a group using the ‘Request new group’ form in the top-right of the groups gallery. Groups can now add a photo to help personalise their page, alongside information about the group. Search system overhauled to give much better results: We’ve replaced the search result system with a completely new engine that gives much better results. After a week of tuning the results, we think this now seems to find what you’re looking for pretty consistently. Secondly, we’ve added pagination, so you’re no longer limited to one page of results. 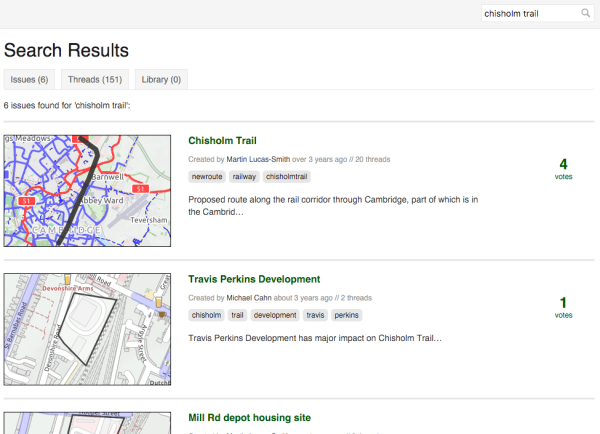 Another long-awaited improvement is that searches within a group’s area will only return results from that area. So if you’re in, say, Camden Cyclists’ Cyclescape area, you won’t get results polluted with issues from Cambridge, Sheffield, Leeds, or wherever. Getting discussions by e-mail now better: Did you know that you can also get Cyclescape discussions by e-mail? In fact, Cyclescape can be used like lots of mini e-mail lists, which you can choose to subscribe/unsubscribe to on a per-thread basis. We’ve made a number of improvements. Firstly, you can now enable digests, so you can read what’s happening by getting a single e-mail a day. Next, e-mails are now properly threaded. Also, we’ve added deadline reminders, so you’ll get a reminder a day or two before a date in a thread you’re subscribed to. 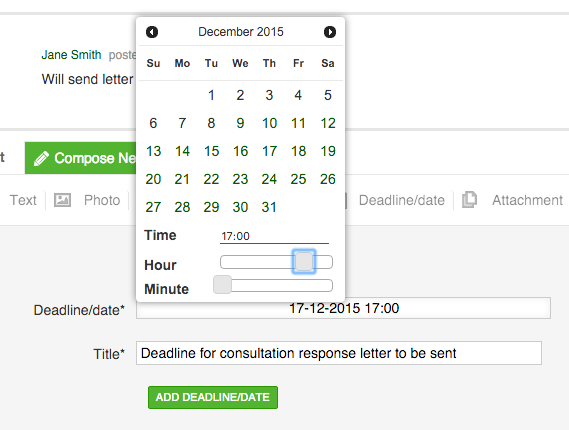 So fewer excuses for missing deadlines now! A further improvement is that new users, and users newly-subscribed to a group, now receive a welcome e-mail to confirm each of these. Deadline management improvements: In case you didn’t know, your ‘My Cyclescape’ page has a listing of all the deadlines/dates in the threads you are subscribed to. So it’s easy to get an overview of what’s coming up. We’ve added an iCal feed, so that if you use a calendaring system like Apple Calendar, Google Calendar, Outlook, etc., you can have these events appear automatically in your calendar. Also, if you have e-mail enabled, each deadline/date e-mail will now include an iCal attachment for that deadline/date. Another improvement is that you can now specify a time, rather than purely just a day, when replying in a thread.